Achieve professional quality sound on a limited budget! Harness all new, Hollywood style audio techniques to bring your independent film and video productions to the next level. 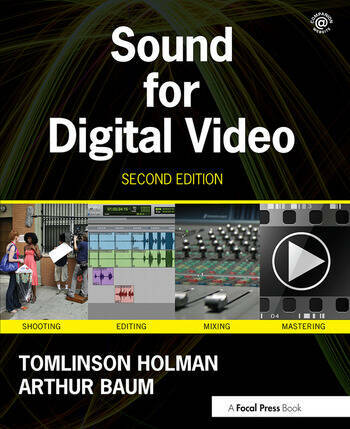 In Sound for Digital Video, Second Edition industry experts Tomlinson Holman and Arthur Baum give you the tools and knowledge to apply recent advances in audio capture, video recording, editing workflow, and mixing to your own film or video with stunning results. This fresh edition is chockfull of techniques, tricks, and workflow secrets that you can apply to your own projects from preproduction through postproduction. Instruction in connectors, real-time transfers, and file-based transfers from DVDs, hard drives, and solid state media. Blu-Ray and HD tape formats for mastering and distribution in addition to file-based, DV, and DVD masters. Whether you are an amateur filmmaker who wants to create great sound or an advanced professional in need of a reference guide, Sound for Digital Video, Second Edition is an essential addition to your digital audio tool belt. What can be done with an on-camera microphone? Tomlinson Holman is one of the most prominent figures in audio today. He is widely known for introducing new products and processes in the field, including the THX Sound System, Home THX, and the THX Digital Mastering program developed while he was Corporate Technical Director at Lucasfilm, Ltd. Mr. Holman has won career achievement awards from Cinema Audio Society and the Custom Electronics Design and Installation Association, as well as an Academy Award for Technical Achievement in 2001. His feature film credits include Indiana Jones and the Temple of Doom and Star Wars: Return of the Jedi among others. Arthur Baum received his bachelor's degree in physics and mathematics from Harvard University and went on to study film sound at the University of Southern California. He has mixed and recorded sound for several independent films, webisodes, and documentaries and has edited sound for television programs airing on Discovery Channel, Syfy Network, Cartoon Network, and Animal Planet. In addition to his work on independent and corporate projects, Mr. Baum has served on the faculty of the USC School of Cinematic Arts, teaching sound theory and technique to incoming film production students.